However, there is a lot of other interesting science we can get out of this event as well, which implications for many subfields of astrophysics. Just scan this list of 81 (at last count) papers about the event for an idea of the magnitude of physics we can do here. Today’s paper goes all the way into the field of cosmology and uses the event to derive the Hubble Constant completely independently of existing calculations. The Hubble Constant describes the expansion of the universe and is one of three terms in the simple equation Hubble’s law: v = H0 d, where v is the recessional velocity/Hubble flow (the speed at which an object is moving away due to the expansion of the universe) and d is the proper distance. Many other experiments have estimated H0 to be roughly equal to 70 (km/s)/Mpc. All of these measurements rely on the “cosmic distance ladder” and “standard candles” such as supernovae to estimate the distance, assuming that brightness and distance to an object can be directly correlated. However, there are possibly some problems with calibration of these standard candles. It would be great to have a way to directly measure distances, and in turn get H0! This is where gravitational waves come in – since it is possible to get the distance from a gravitational wave event, they can be used as “standard sirens” (called “standard sirens” instead of “standard candles” because the terminology around gravitational waves centers around sound rather than light). This idea for doing this has been around for years, long before gravitational waves were discovered. A value of H0 derived this way can be completely independent of values derived using electromagnetic data. The neutron star merger announced this week occurred at a distance of ~ 40 megaparsecs (~130 million light years), determined simply by looking at the amplitude of the gravitational wave signal. This matches up well with the distance to the host galaxy NGC 4993 using the Tully-Fisher relation, so we are pretty confident in it. This means that all the authors had to do in order to estimate H0 was to calculate the value for the Hubble flow (v in the equation above). This is normally also determined using the Tully-Fisher relation, but in order for the result to be completely independent of H0 values determined using the electromagnetic spectrum, the authors chose not to do this. Instead, they estimated the Hubble flow velocity by correcting for the local peculiar motions (deviations from the pure Hubble flow due to movements within the galaxy cluster, etc.) of NGC 4993. The recession velocity of the galaxy collection NGC 4993 is known but needed to be corrected due to a bulk flow towards The Great Attractor. They ultimately determined a value of v = 3017 +/- 166 kilometers per second. Figure 1: The marginalized posterior density (blue curve) for the value of H0 (i.e. 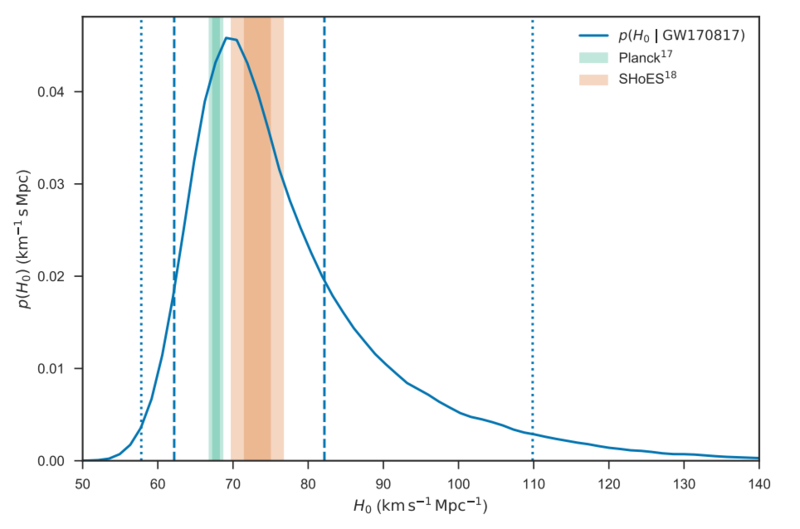 the probability that H0 has a specific value given the evidence) determined solely from this gravitational wave event. The green and orange are the 1 and 2 sigma constraints from Planck and ShoES respectively on H0. The value based on the gravitational wave is consistent with both of these values. The dotted/dashed lines are the 1/2 sigma minimal credible intervals on the gravitational wave data (Source: Figure 1 from the paper). Carrying out a Bayesian analysis that took into account uncertainties in the velocity and distance determinations, the authors come up with a value for Ho of 70.0 (km/s)/Mpc. The error bars on this are a little large (+12.0/-8.0) but it is consistent with other experiments while being completely independent of them! This shows that even when systematic uncertainties are taken into account, there is no great difference in quantities calculated using gravitational waves and those calculated using the electromagnetic spectrum. As more and more gravitational waves are detected, more independent measurements can be used to improve this estimate. We now have a new method that can be used to probe cosmological questions!